Fun February Facts: Feb 20th is the World Day of Social Justice, the day George Washington signed the Postal Service Act in 1792 (establishing the United States Post Office Department), the Metropolitan Museum of Art opened in New York City in 1872, Tchaikovsky’s ballet Swan Lake received its première performance at the Bolshoi Theatre in Moscow in 1877, aboard Friendship 7 John Glenn became the first American to orbit the earth in 1972 (making three orbits in 4 hours, 55 minutes) and is the birthday of Ansel Adams, American photographer, in 1902. In going through Fabulous February I came across a guy named Francis Galton, who’s birthday was on the 16th. I was so impressed with him I not only made him the Feb 16th famous birthday representative but I ended up researching him in a bit. What I found was pretty neat (at least by my standards) so I thought I would share the quick story of Francis Galton. 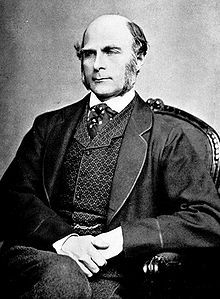 Sir Francis Galton, FRS (February 16, 1822 – January 17, 1911) was an English Victorian progressive, polymath, psychologist, anthropologist, eugenicist, tropical explorer, geographer, inventor, meteorologist, proto-geneticist, psychometrician, and statistician. He was knighted in 1909. He was a pioneer in eugenics, coining the term itself and the phrase “nature versus nurture”. His book Hereditary Genius (1869) was the first social scientific attempt to study genius and greatness. As an investigator of the human mind, he founded psychometrics (the science of measuring mental faculties) and differential psychology and the lexical hypothesis of personality. He devised a method for classifying fingerprints that proved useful in forensic science. He also conducted research on the power of prayer, concluding it had none by its null effects on the longevity of those prayed for. Wow. Francis Galton was a very busy, eclectic and pioneering guy, particularly in the world of science, and I had never heard of him before a couple days ago. The guy who created statistical correlation and using questionnaires/surveys for collecting data on human communities. Those two things are what most of our science, particularly in nutrition and health, is based on. The foundation of almost all big health data we have about humans comes from data gathered by questionnaires and surveys and then correlating that to health/disease outcomes. In essence, much of what we think we know about health, nutrition and the human body stands upon the statistical methods he developed and pioneered. His connection with Charles Darwin is another fascinating piece, whose work helped shape Galton’s work genetics and evolution. He was fascinated with and a pioneer in the field of improving the genetic quality of human population, which he named eugenics. Most of us know this concept from the extreme version popularized by Hitler and the Nazis. He also coined the phrase “nature vs. nurture” and was a leader in developing and exploring this concept. To this day, I and many others look at the world, health in particular, through this genetic vs. environment lense. The anti-cyclone – theorized the concept of a large-scale circulation of winds around a central region of high atmospheric pressure, clockwise in the Northern Hemisphere, counterclockwise in the Southern Hemisphere. Weather maps – Galton prepared the first weather map published in The Times (1 April 1875, showing the weather from the previous day, 31 March), now a standard feature in newspapers worldwide. Synaesthesia – stimulating one sensory or cognitive pathway leads to automatic, involuntary experiences in a second sensory or cognitive pathway. Differential psychology – Galton’s study of human abilities ultimately led to the foundation of differential psychology and the formulation of the first mental tests. Lexical hypothesis – the idea that the most salient and socially relevant personality differences in people’s lives will eventually become encoded into language. The hypothesis further suggests that by sampling language, it is possible to derive a comprehensive taxonomy of human personality traits. Heredity – the nature and mechanism of heredity, one of his biggest interests and contributions. Historiometry – historical study of human progress or individual personal characteristics, using statistics to analyze references to geniuses, their statements, behavior and discoveries in relatively neutral texts. Hereditary Genius was the first social scientific attempt to study genius and greatness. Eugenics – developed, named and pioneered and authored Inquiries into Human Faculty and Its Development. Behavioral Genetics – by using twin studies, he anticipated the modern field of behavioural genetics. He also proposed adoption studies, including trans-racial adoption studies, to separate the effects of heredity and environment. Biometric Heredity – Using statistical techniques to study continuous traits and population-scale aspects of heredity. Coined the phrase “nature vs. nurture” and in the 1874 book English men of science: their nature and nurture, further promoted the nature versus nurture question and provided fascinating data on the sociology of scientists of the time. Galton devoted much of the rest of his life to exploring variation in human populations and its implications, at which Darwin had only hinted. In so doing, he established a research program which embraced multiple aspects of human variation, from mental characteristics to height; from facial images to fingerprint patterns. This required inventing novel measures of traits, devising large-scale collection of data using those measures, and in the end, the discovery of new statistical techniques for describing and understanding the data. Fingerprints – Galton estimated the probability of two persons having the same fingerprint and studied the heritability and racial differences in fingerprints. He wrote about the technique, identifying common pattern in fingerprints and devising a classification system that survives to this day. He described and classified them into eight broad categories: 1: plain arch, 2: tented arch, 3: simple loop, 4: central pocket loop, 5: double loop, 6: lateral pocket loop, 7: plain whorl, and 8: accidental. Correlation – discovered the concept and demonstrated its application in the study of heredity, anthropology, and psychology. Regression (to the Mean) – invented the use of the regression line and was the first to describe and explain the common phenomenon of regression toward the mean. He is responsible for the choice of r (for reversion or regression) to represent the correlation coefficient. Standard Deviation – conceived this as a measure to quantify normal variation. Quincunx – a pachinko-like device, also known as the bean machine, a tool for demonstrating the law of error and the normal distribution. Discovered the properties of the bivariate normal distribution and its relationship to regression analysis. Galton’s later statistical study of the probability of extinction of surnames led to the concept of Galton–Watson stochastic processes. This is now a core of modern statistics and regression. In the 1870s and 1880s he was a pioneer in the use of normal distribution to fit histograms of actual tabulated data. Questionnaire/Survey – pioneered use of in many fields, particularly human characteristics and behavior. Cartography – pioneering cartographic survey of South West Africa (now Namibia), “Narrative of an Explorer in Tropical South Africa”. The best-selling The Art of Travel, a handbook of practical advice for the Victorian on the move, went through many editions and is still in print. Composite Portraiture – produced by superimposing multiple photographic portraits of individuals’ faces registered on their eyes to create an average face. In the 1990s, a hundred years after his discovery, much psychological research has examined the attractiveness of these faces, an aspect that Galton had remarked on in his original lecture. Others, including Sigmund Freud in his work on dreams, picked up Galton’s suggestion that these composites might represent a useful metaphor for an Ideal type or a concept of a “natural kind”. Galton hoped his technique would aid medical diagnosis, and even criminology through the identification of typical criminal faces. Unfortunately, his ideas and techniques ended up being used by certain people and/or groups (i.e. the Nazis) interested in eugenics or an ultimate race as a way to identify people who fit Jewish or other “subhuman” standards. Sound & Hearing Ranges – he proposed an early theory of ranges of sound and hearing, and collected large quantities of anthropometric data from the public through his popular and long-running Anthropometric Laboratory, which he established in 1884, and where he studied over 9,000 people. Galton Whistle – a type of whistle that emits sound in the ultrasonic range, which people cannot hear but some other animals can, including dogs and domestic cats, and is used in their training and can be used for differential hearing tests. – A severe nervous breakdown altered Galton’s original education goals. He elected to take a “poll” (pass) B.A. degree, like Charles Darwin also did. (Following the Cambridge custom, he was awarded an M.A. without further study, in 1847.) He then briefly resumed his medical studies. – The death of his father at age 22 left him financially independent but emotionally destitute and he terminated his medical studies entirely, turning to foreign travel, sport and technical invention. – He was an accomplished Free Mason. – He became very active in the British Association for the Advancement of Science, presenting many papers on a wide variety of topics at its meetings from 1858 to 1899. He was the general secretary from 1863 to 1867, president of the Geographical section in 1867 and 1872, and president of the Anthropological Section in 1877 and 1885. He was active on the council of the Royal Geographical Society for over forty years, in various committees of the Royal Society, and on the Meteorological Council. – In 1888, Galton established a lab in the science galleries of the South Kensington Museum. In Galton’s lab, participants could be measured to gain knowledge of their strengths and weaknesses. Galton also used these data for his own research. He would typically charge people a small fee for his services. – During this time, Galton wrote a controversial letter to the Times titled ‘Africa for the Chinese’, where he argued that the Chinese, as a race capable of high civilisation and (in his opinion) only temporarily stunted by the recent failures of Chinese dynasties, should be encouraged to immigrate to Africa and displace the supposedly inferior aboriginal blacks. – Galton suggested in a letter to the journal Nature a better method of cutting a round cake by avoiding making radial incisions. – In an effort to reach a wider audience, Galton worked on a novel entitled Kantsaywhere from May until December 1910. The novel described a utopia organised by a eugenic religion, designed to breed fitter and smarter humans. His unpublished notebooks show that this was an expansion of material he had been composing since at least 1901. He offered it to Methuen for publication, but they showed little enthusiasm. Galton wrote to his niece that it should be either “smothered or superseded”. His niece appears to have burnt most of the novel, offended by the love scenes, but large fragments survived. – Galton was knighted in 1909. – His statistical heir Karl Pearson, first holder of the Galton Chair of Eugenics at University College London (now Galton Chair of Genetics), wrote a three-volume biography of Galton, in four parts, after his death (Pearson 1914, 1924, 1930). – The flowering plant genus Galtonia was named in his honour. Now that was one busy guy. P.S. Here’s the Wikipedia page for Galton, which gets into more detail and offers many more references to follow if interested. Next Is Cholesterol Finally Off The Hook?